“Our Gear customers have been looking for more water-resistant products, and now with the Speedo partnership and the Gear Sport and Gear Fit2 Pro, we are delivering the best experience to meet their demands. 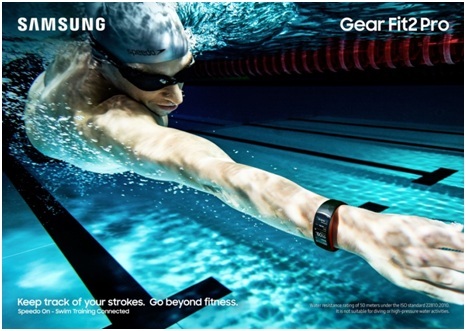 Samsung Electronics Co., Ltd. and Speedo International Ltd are helping swimmers across the globe track their activity. Their Partnership brings new level of swim tracking to consumers while strengthening Samsung’s innovations with Wearables. On August 30, 2017, Samsung launched the Speedo On swim tracking app which is featured on Samsung’s new Gear Sport and Gear Fit2 Pro as described in Samsung Gear Sport, Gear Fit2 Pro and Gear IconX is Personalized Motivation. With both devices being 5 ATM certified for water resistance in up to 50-meters, the Gear Sport and Gear Fit2 Pro become the ideal companion for any swim. The new Samsung Gear Fit2 Pro features the Speedo On swim tracking app pre-installed. The Speedo On is powered by Speedo’s expertly developed algorithm for optimum accuracy and seamless data transfer into the Speedo On web-based platform. So what exactly does the Speedo On swim tracking app do? Developed for data driven fitness swimmers, the interactive swim tracking platform acts as a comprehensive training partner. On both the Samsung Gear Sport and Gear Fit2 Pro the Speedo On app enables swimmers to complete time trials and get their SWOLF score (a swim efficiency measure). Paired with the two new devices, consumers have options for what works best to complement their activity needs in the water to easily track and incorporate swim achievements into personal fitness goals. Gear Sport is a sleek and stylish smartwatch with premium features while the Gear Fit2 Pro is an all-new ergonomic fitness band with continuous heartrate monitoring and GPS tracking. The data from Speedo On is also compatible with Samsung Health, Samsung’s comprehensive fitness tracking platform, to deliver a broader picture of health and wellness information. The Speedo On offers analysis of your swims and tracks your progress against your fitness goals. It also gives you additional training programs, tips and advice tailored to you developed by some of the world’s best coaches and athletes. The Speedo On, also gives swim a social dimension, allowing you to follow other swimmers, take part in challenges and share achievements. Samsung and Speedo will have you in top performing condition with the Speedo On swim tracking app.